Happy birthday, Abe and Charles! From Smithsonian Magazine’s 2009 article, “How Lincoln and Darwin Shaped the World.” Illustration by Joe Ciardiello. On this day in 1809, just a few hours apart, Charles Darwin and Abraham Lincoln were born. What are the odds of historic coincidences like that? Lincoln’s birthday is still listed in law as a date to fly the U.S. flag, though we’ve changed the celebration to the following week and the generic President’s Day, closer to George Washington’s real birthday, February 22. President’s Day is celebrated on the third Monday in February. News will feature more celebrations of Darwin than Lincoln, today, I predict — Darwin Day is a worldwide celebration by science nerds. Both Lincoln and Darwin worked to end slavery. Darwin probably had more of an idea that racial discrimination had no science basis. Lincoln had more political sway. After Lincoln and Darwin, science and human rights advanced greatly, because of their work. 154 years ago this week, Abraham Lincoln redefined the Declaration of Independence and the goals of the American Civil War, in a less-than-two-minute speech dedicating part of the battlefield at Gettysburg, Pennsylvania, as a cemetery and final resting place for soldiers who died in the fierce battle fought there the previous July 1 through 3. Interesting news if you missed it: More photos from the Library of Congress collection may contain images of Lincoln. The photo above, detail from a much larger photo, had been thought for years to be the only image of Lincoln from that day. The lore is that photographers, taking a break from former Massachusetts Sen. Edward Everett’ s more than two-hour oration, had expected Lincoln to go on for at least an hour. His short speech caught them totally off-guard, focusing their cameras or taking a break. Lincoln finished before any photographer got a lens open to capture images. The plate lay unidentified in the Archives for some fifty-five years until in 1952, Josephine Cobb, Chief of the Still Pictures Branch, recognized Lincoln in the center of the detail, head bared and probably seated. 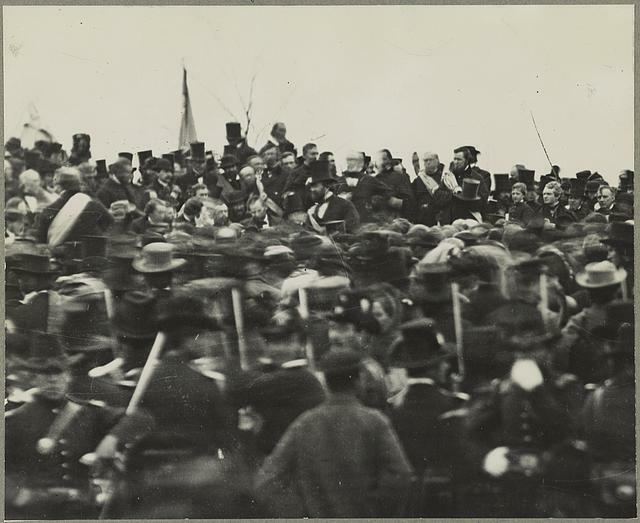 To the immediate left (Lincoln’s right) is Lincoln’s bodyguard, Ward Hill Lamon, and to the far right (beyond the limits of the detail) is Governor Andrew G. Curtin of Pennsylvania. Cobb estimated that the photograph was taken about noontime, just after Lincoln arrived at the site and before Edward Everett’s arrival, and some three hours before Lincoln gave his now famous address. On-line, the Abraham Lincoln Blog covered the discovery that two more photographic plates from the 1863 speech at Gettysburg may contain images of Lincoln in his trademark stove-pipe hat. Wander over to the story at the USA Today site, and you can see just how tiny are these detail images in relation to the photographs themselves. These images are tiny parts of photos of the crowd at Gettysburg. (The story ran in USA Today last Thursday or Friday — you may be able to find a copy of that paper buried in the returns pile at your local Kwikee Mart.) Digital technologies, and these suspected finds of Lincoln, should prompt a review of every image from Gettysburg that day. To the complaints of students, I have required my junior U.S. history students to memorize the Gettysburg Address. In Irving I found a couple of students who had memorized it for an elementary teacher years earlier, and who still could recite it. Others protested, until they learned the speech. This little act of memorization appears to me to instill confidence in the students that they can master history, once they get it done. To that end, I discovered a good, ten-minute piece on the address in Ken Burns’ “Civil War” (in Episode 5). On DVD, it’s a good piece for classroom use, short enough for a bell ringer or warm-up, detailed enough for a deeper study, and well done, including the full text of the address itself performed by Sam Waterson. Interesting note: P. Z. Myers at Pharyngula noted in 2007 that the Gettysburg Address was delivered “seven score and four years ago.” Of course, that will never happen again. I’ll wager he was the first to notice that odd juxtaposition on the opening line. On June 20, 1863, West Virginia joined the fractured union as the 35th state. Yes, that was during the Civil War. Yes, West Virginia had been the northwestern counties of Virginia. No, I’m not sure of the history of how Congress decided Virginia had consented to be divided. In any case, per the guidelines in the U.S. Flag Code, West Virginians should fly the U.S. flag today in honor of their statehood, 154 years ago. West Virginia no doubt has lots of celebrations, reenactments, and general festive events planned. Sunday I had a visit with a fellow who was born in western Virginia, went to school at Virginia Tech, and knew the New River geography (which was how we got into the conversation). He said the New River emptied into a river whose name he could never pronounce. Took a few minutes to realize he meant the Kanawha River, shown in the photo above. Pronouncing the river, and the county correctly is an interesting exercise. We once thought about living along the Kanawha, and I appreciated the frustration of our Virginia friend. Kathryn and I have a few fond memories of Charleston on the banks of the Kanawha River. Then-West Virginia Attorney General Charlie Brown was one of the few with enough wisdom to offer me a job, when I graduated from the National Law Center at George Washington University as an older student. 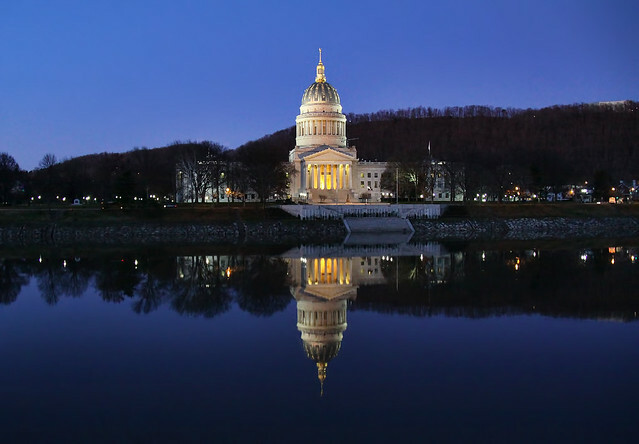 Brown promised to clean up West Virginia politics, and he had a lively, very young crew of attorneys fighting coal companies, oil companies, loggers, shady real estate people, and corrupt city, county and state officials. One fellow in the office complained that he’d “had to argue eight cases” at the State Supreme Court that year, in his first year out of law school. But the corrupt officials knew what they were doing. Brown could only offer $25,000 a year, and in Charleston it was unlikely we’d be able to find any work for Kathryn. Tough to attract crime fighters at less-than crime-fighting rates. It would have been a more than 75% cut in income. We made a trip there to mull it over, baby on the way (pre-digital photographs buried in the archives). Brown got a special dispensation to offer me $5,000 more. Great tour of the Capitol, great interviews with the office lawyers. Kathryn and I sat for a long while in the deserted West Virginia Supreme Court (sort of tucked into an attic of the Capitol) discussing how in the world we could afford to move the Charleston and take on the work. We drove around the city, looking at houses for sale and rent; we gazed at the Kanawha River and discussed the future for the city. We went to dinner in a tiny restaurant touted as Charleston’s finest, which was a long way from good eateries in D.C. We discussed with our host the cultural pickings in Charleston. We could give up the symphony but get back to fishing and practice fly fishing . . .
A few tables over, the maitre ‘d brought in a few extra chairs, and then seated Muhammad Ali and his party. Our waiter asked that we not make a scene. I don’t remember for what charitable purpose Ali was in Charleston, but the event was over and his hosts took him out to the good restaurant in Charleston, too. Ali was a slower, sedate and gentle version of the fiery fighter he’d been. Parkinson’s disease already had him in its grip. His voice, soft as it could be at times, was still strong enough to carry across a table. There was a young boy with the group, under five years old. Ali had lost steps, but not spirit. He produced a couple of balls from a pocket and proceeded to dazzle the kid with sleight-of-hand magic tricks. He picked one of the balls from behind the kid’s ear, and the kid giggled wonderfully. Balls appeared here, disappeared there — I remember thinking how much easier those tricks could be with hands that big; but Ali also had difficulty dealing with a knife and fork. Working magic tricks pulled years away from Ali, and he seemed much younger, much more deft than he really was. The little boy laughed and giggled through the meal. It was a happy affair. I turned down the offer from West Virginia. A job I’d hoped for at American Airlines fell through, but a position opened up at the Office of Educational Research and Improvement (OERI) at Bill Bennett’s Department of Education. A year or so later I saw small item in the Washington Post that Charlie Brown had been indicted on some charge. Coal companies still have a lot of clout in West Virginia. This is an anniversary day for Ali, too: June 20, 1967, Muhammad Ali was convicted in Houston, Texas, of evading the draft. That conviction was overturned by the U.S. Supreme Court. Fly those flags in West Virginia. From the Andersonville National Historic Site Twitter account: Our Avenue of Flags went up today in celebration of Memorial Day! 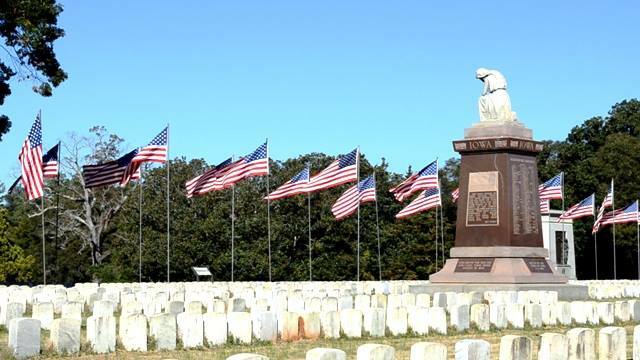 You can view these rows of American flags in the cemetery until May 31. The Andersonville NHS is in Andersonville, Georgia. Memorial Day grew greatly after the U.S. Civil War, as people worked to commemorate those who died in the war, on both sides. Andersonville contributed many of those deaths. Memorial Day is Monday, May 28, in 2017, a day for all Americans to fly the U.S. flag. A view from the cemetery at Andersonville NHS. NPS photo. In the summer of 1861, both Unionists and Confederates expected a short fight to settle what would come to be known as the American Civil War. South Carolina fired on the Union Ft. Sumter in April. But the first major action did not sully history until July. 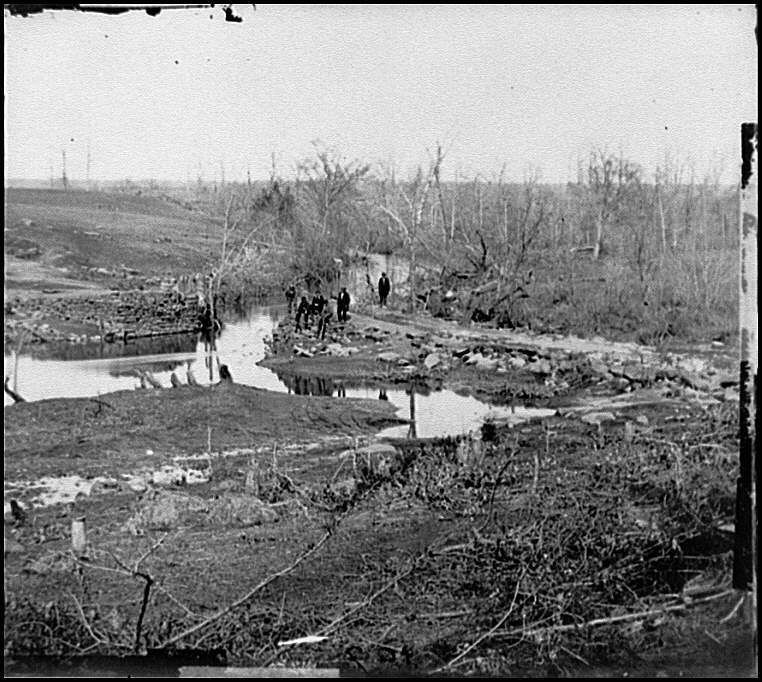 Confederate forces and Union forces massed for a battle near Manassas, Virginia, at a little creek called Bull Run. Spectators came out from Washington, D.C., bringing the family and picnic lunches, expecting a great drama to unfold — but they were surprised by the actual carnage. What did they expect? This battle gave rise to the famous, true story of farmer Wilmer McLean. His house backed up on what would become the battlefield. His summer kitchen took a cannonball. Hoping to avoid further entanglement in the war, McLean moved his family and his farming farther south, to the unlikely-named town of Appomattox Courthouse. 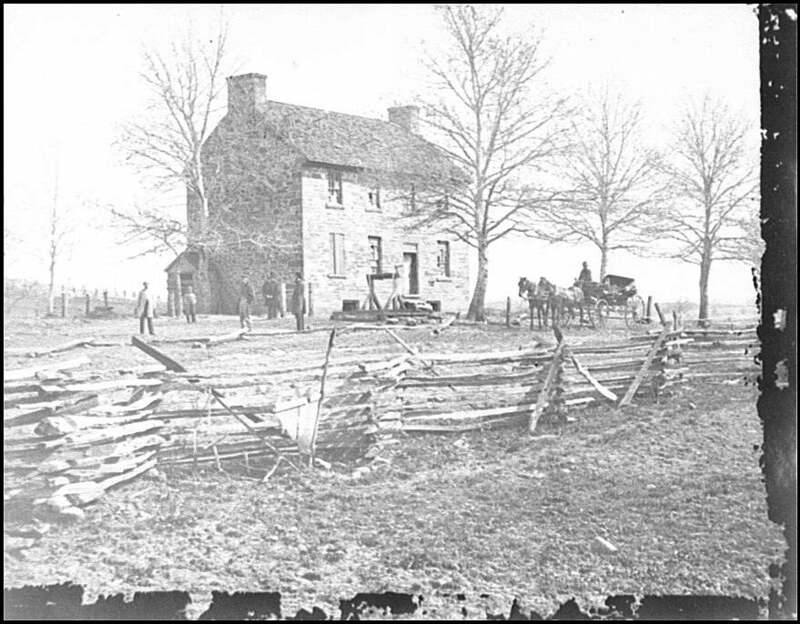 There, in 1865, Gen. U.S. Grant’s entourage asked to borrow McLean’s parlor, for the surrender of Gen. Robert E. Lee. McLean was able to say, with some high accuracy, that the war began in his back yard, and ended in his front room. On July 21, 1861, a dry summer Sunday, Union and Confederate troops clashed outside Manassas, Virginia, in the first major engagement of the Civil War, the First Battle of Bull Run. Union General Irvin McDowell hoped to march his men across a small stream called Bull Run in the vicinity of Manassas, Virginia, which was well-guarded by a force of Confederates under General P. G. T. Beauregard. McDowell needed to find a way across the stream and through the Southern line that stretched for over six miles along the banks of Bull Run. McDowell launched a small diversionary attack at the Stone Bridge while marching the bulk of his force north around the Confederates’ left flank. The march was slow, but McDowell’s army crossed the stream near Sudley Church and began to march south behind the Confederate line. Some of Beauregard’s troops, recognizing that the attack at Stone Bridge was just a diversion, fell back just in time to meet McDowell’s oncoming force. These photographs of First Bull Run were not made at the time of the battle on July 21, 1861; the photographers had to wait until the Confederate Army evacuated Centreville and Manassas in March 1862. Their views of various landmarks of the previous summer are displayed here according to the direction of the Federal advance, a long-flanking movement along Sudley’s Ford. When Beauregard learned of the attack, he sent reinforcements to aid the small group of Southerners, but they were unable to hold back the oncoming tide of Union troops. As more Union soldiers joined the fray, the Southerners were slowly pushed back past the Stone House and up Henry Hill. The battle raged for several hours around the home of Mrs. Judith Henry on top of Henry Hill, with each side taking control of the hill more than once. Slowly, more and more Southern men poured onto the field to support the Confederate defense, and Beauregard’s men pushed the Northerners back. At this point in the battle, Confederate General Barnard Bee attempted to rally his weary men by pointing to Brigadier General Thomas Jackson, who proudly stood his ground in the face of the Union assault. Bee cried, “There stands Jackson like a stone wall!” From that moment on, Thomas Jackson was known as “Stonewall” Jackson. As the day wore on, the strength of McDowell’s troops was sapped by the continuous arrival of fresh Southern reinforcements. Eventually, the stubborn Confederates proved more than a match for McDowell’s men, and the Northerners began to retreat across Bull Run. The Union pullout began as an orderly movement. However, when the bridge over Cub Run was destroyed, cutting off the major route of retreat, it degenerated into a rout. The narrow roads and fords, clogged by the many carts, wagons, and buggies full of people who had driven out from Washington, D.C., to see the spectacle, hampered the withdrawal of the Union Army. The Southerners tried to launch a pursuit, but were too tired and disorganized from the day’s fighting to be effective. The morning of July 22 found most of the soldiers of the Union Army on their way back to Washington or already there. It was more than a year before the Northerners attempted once again to cross the small stream outside of Manassas named Bull Run. Search the collection Selected Civil War Photographs on Bull Run to find more photographs documenting both the First Battle of Bull Run and the Second Battle of Bull Run. View a manuscript map of the battlefield, executed a month after the first Battle of Bull Run. Through the use of a profile, the draftsman demonstrates that the height of the corn, the depth of the creek, and other features of the site influenced the course of the battle. This map is just one of numerous items related to the Civil War found in the online exhibition American Treasures of the Library of Congress. Search the collection of Civil War Maps on Bull Run or Manassas to find maps of the battlefield area including the New York Daily Tribune War Maps published on July 30, 1861 that include a list of those injured or killed in the battle. Civil War Treasures from the New-York Historical Society contains fifteen stereographs of Bull Run. Search on Manassas or Bull Run in Military Battles and Campaigns to find maps of the conflict. View Primary Documents in American History: Civil War and Reconstruction, 1860-1877 for a look at some of the most important documents of the Civil War era. Search the Today in History Archive on Civil War battle to find more features on the war, including the Second Battle of Manassas which occurred a year after the First Battle of Bull Run; the Battle of Antietam, and Day One,Day Two, and Day Three of the Battle of Gettysburg. Ovation to Lieutenant General Grant at the Cooper Institute, New York, on the evening of June 7 – Grant saluting the audience Digital ID: (b&w film copy neg.) cph 3c28383 (http://hdl.loc.gov/loc.pnp/cph.3c28383) Reproduction Number: LC-USZ62-128383 (b&w film copy neg.) Repository: Library of Congress Prints and Photographs Division Washington, D.C. 20540 USA; Illus. in: Frank Leslie’s Illustrated Newspaper, v. 20, no. 508 (1865 June 24), p. 209. People of New York idolized Lt. Gen. U. S. Grant. They gave Grant and his family a home. 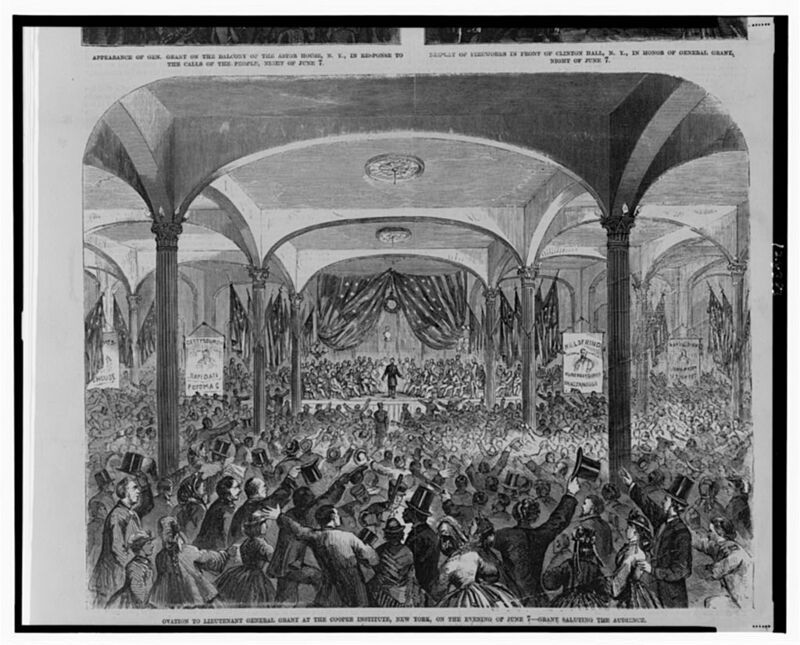 On June 7, 1865, he spoke at Cooper Union and got a rousing ovation in return. Looking for details on that speech. Holler if you have some. You are currently browsing the archives for the 1861-1865 category.